An actor best known for her slightly devious roles on shows like Game Of Thrones and The Tudors, Natalie Dormer knows how to make an audience just a little bit afraid of her. That’s something that comes across in The Hunger Games: Mockingjay—Part 2, in which Dormer plays the slightly hard-assed Cressida, star producer of the “propos” that are helping the rebels win the war. Though Cressida’s just doing what she can to help her cause, she’s also terrifying, a cold-faced master of public relations in a class war that’s all too personal to some of its players, like Jennifer Lawrence’s Katniss Everdeen. The A.V. 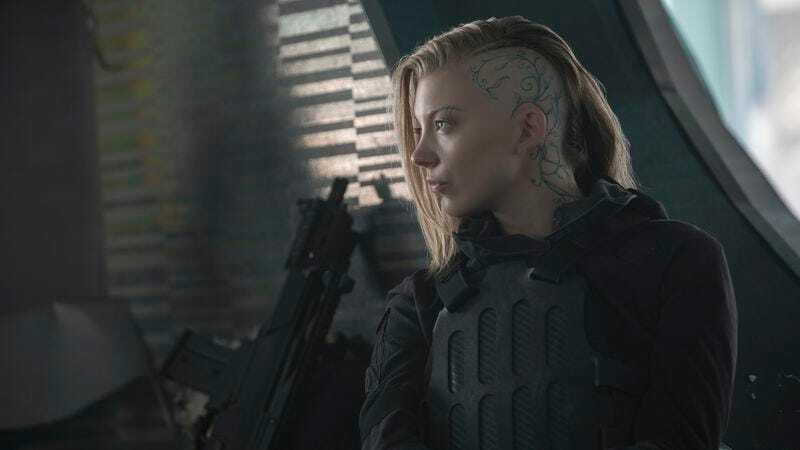 Club talked to Dormer her roles in both The Hunger Games and Game Of Thrones, as well as whether she’s familiar with those ever-present “How To Date Natalie Dormer” web ads. The A.V. Club: You’ve played quite a few savvy or maybe devious characters, like Anne Boleyn on The Tudors, Cressida in The Hunger Games, Moriarty on Elementary, and Margaery Tyrell on Thrones. Do you go after those types of parts specifically or do they come to you? Natalie Dormer: No, it just happens by accident. I don’t know. It’s really interesting because it wasn’t until I was halfway through shooting the Game Of Thrones that I realized that in the last two and a half years, I’d played a load of PR-savvy women. I mean, Margaery is so PR savvy. That’s her power play within the Game Of Thrones. Cressida’s packaging of propaganda is also a form of PR manipulation, and then I also played The Scandalous Lady W, Lady Worsley, for BBC at the beginning of the year, and she was one of the first women historically to harness the tabloid British press to fight her husband. So it completely happened by accident, to be perfectly honest. It comes from the writing, I suppose. I just look for good scripts and good characters, and it’s a dimension that, if it happened as a motif through my work in the last few years, it’s not something I did consciously at all. AVC: How do you walk the line between being PR savvy and being unlikable? ND: You mean in real life? AVC: No, as a character. For instance, you could say Cressida is slightly unlikable. ND: Yeah, but I don’t think she is. I think people have got to be realistic about how we all package ourselves. Just look at your Facebook account. If anyone’s got a message, you package it. That’s what we do, and that’s why I love the Mockingjay films, because for a younger audience it deals with all these things, the pressure that they feel to portray themselves a certain way. And that’s the wonder of Katniss Everdeen—that she is a reluctant hero. She’s an imperfect hero. She’s struggling with just wanting her self-identity and what is expected of her by other people, what they are trying to make her seem to be. And I think this is something for young people, especially, but that all of us can identify with, being asked to constantly present a heightened best image of yourself. We’re all just human and we’re all flawed. To answer your question about Cressida specifically—she’s a freedom fighter. She’s left her home because of a repressive, tyrannical government, and she’s going to use every skill set that she has to liberate the people so that they’re not ruled by a despot anymore. So it makes no difference whether you switch on CNN, Al Jazeera, or the BBC, everything to do with your news is packaged. It doesn’t mean Cressida is a bad person. This is human nature. AVC: She’s just using what she knows best to do what she can. ND: Yeah. It’s morale boosting, right? It’s a war of hearts and minds. And this is what power play is. She’s just using her specific skill set for what she thinks is the greater good, which is the overthrow of Snow. Margaery Tyrell is like that as well. I genuinely believe that—or it’s how I have played Margaery in the last five years—but Margaery genuinely believes that she would be a good queen for Westeros. She genuinely believes that it would be an improvement for the people of Westeros if she were queen. It’s interesting, it makes you analyze politics and politicians. No one thinks that they’re a monster, you know? No one thinks that of themselves. Everyone has an earnest belief that it would be better if they were in power. So these are really dutiful and important themes to be exploring with young people, and not patronizing them with it. And what happens in the storyline with Alma Coin I think is fantastic for a younger audience to take in and process. AVC: You’ve been in quite a few adaptations, but you’ve also played quite a few real-life people. What’s the difference between the two? ND: It’s a huge responsibility. When you play a real person, you feel a sense of responsibility that obviously you don’t feel when you’re playing a fictional character. It’s something I’ve experienced twice, in Anne Boleyn and Lady Seymour Worsley. I just try to do my research. I do as much research as is physically possible when I’m playing a real person, be they alive or dead. As an actor, your text is your bible, so you’re not making a documentary, but you still have to follow the choices made by your writer. Still, I try and be as informed as I can be about who that person really was. I feel like—at least in the spirit of how I play it, if not in the letter—I feel like it’s paying homage to the real human being. AVC: This is a totally left-field question, but you did an interview with GQ a while ago about “How to Date Natalie Dormer,” and now it’s become this incredibly prevalent ad online. If you Google “How to date Natalie Dormer,” there are pages and pages of ads and other content just about how to date you. ND: That’s totally bizarre. It makes me feel slightly weird. AVC: That’s the question: Is it flattering or is it creepy that people want to know that? ND: I don’t think creepy is the right word. It’s surreal. It’s bizarre. AVC: Is it annoying to have people try to get you to tell them about Game Of Thrones spoilers all the time, or are you just used to it at this point? Look, I just take it as a compliment that people want to know so much, and we make them as fast as we can. It’s like 10 hours of television, and we’re just finishing shooting for season six, so we’re going as fast as we can, folks. Really we are. And we don’t get told a lot of stuff; that’s kind of the best way that David [Benioff] and Dan [Weiss], the creators of the show, protect themselves. They keep us in the dark, and then we’ve got less of a chance of slipping up. We don’t mean to be mean, but normally it’s because we don’t know the answers to the questions. AVC: Do you only know about your character, or about what’s going on in the location you’re in? ND: They do give us the script, but it’s interesting you say that because I have, in the last few years, made the choice—well, a few of us have, now, actually; I think a couple of other people have done it this year as well—but I made the choice a couple of years ago to not read other people’s storylines. I only read Margaery Tyrell and what’s happening in King’s Landing these days, so it means I can actually sit down and watch the show like a fan and enjoy the storylines unfolding as a fan, in real time, the way the fans do. I’ve had a really good experience doing that over the last couple of years, so I’m doing it again this year.